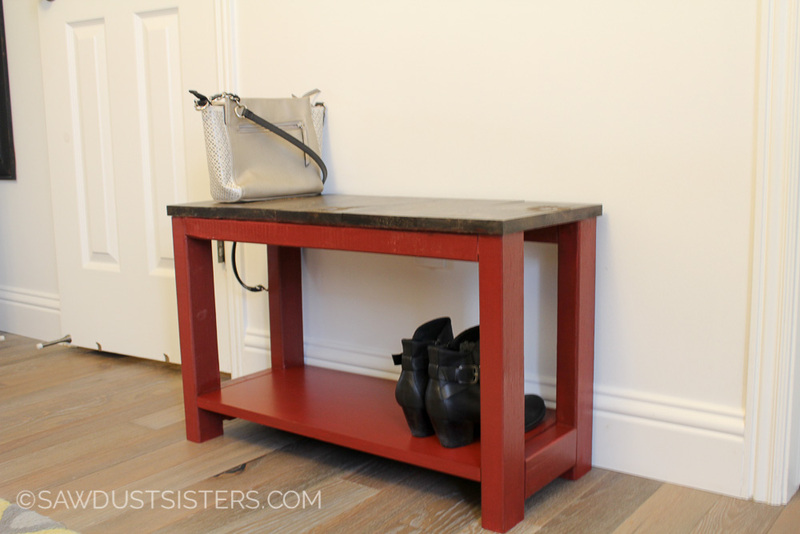 Today I am showing you how to build this super cute, easy, AND stylish DIY mudroom bench! 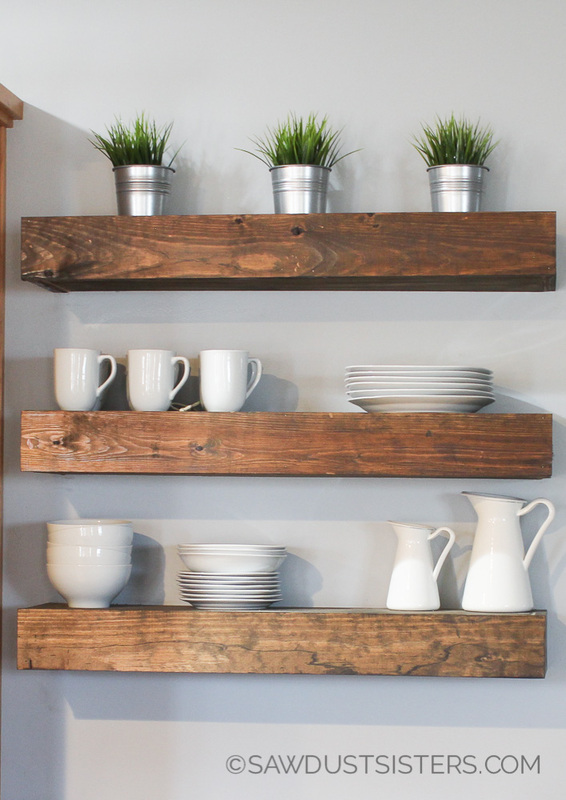 The bottom shelf is perfect for shoes, purses, storage baskets, or whatever you’d like! This project turned out MUCH better than I had anticipated. Most of the wood came from my scrap pile. I love when that happens!! I literally spent less than $10 in lumber on this. Holla! 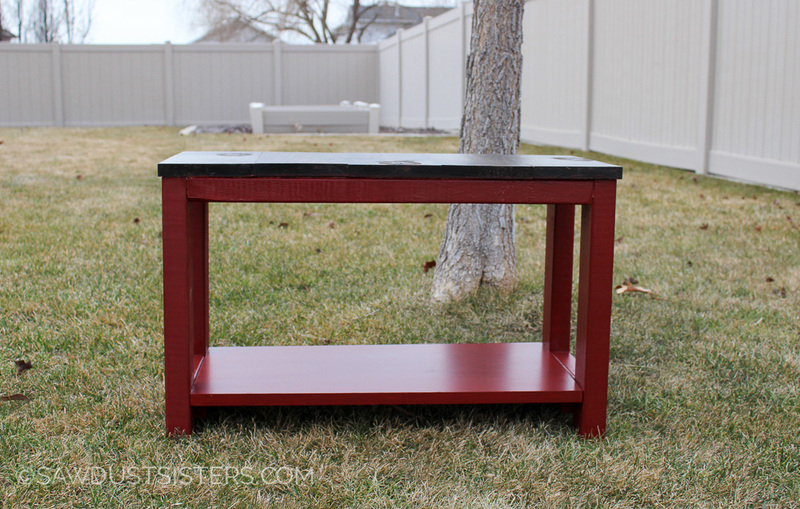 If you are new to the blog, you may not know about my obsession with benches. 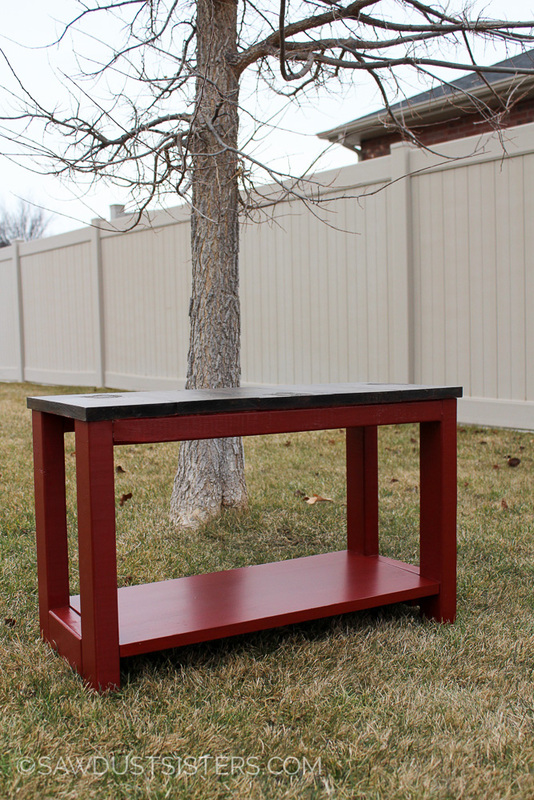 If you are just starting out with woodworking, benches are easy and cheap to build and oh-so-stylish! 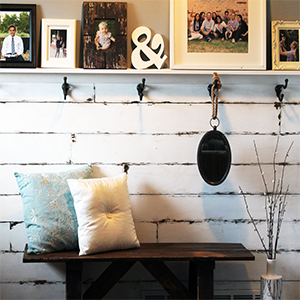 You can find a place for a bench in every room of the house. And I have! Side note: I wonder how many times I’ve used the words easy and cheap on this blog. This bench will be gifted to a friend and co-worker of mine, who graciously let me stay in her beach house last summer. The house has a tiny mudroom, and finding a bench that would fit in there is pretty much impossible, so I built one for her! Here are the dimensions of the piece. Keep scrolling for the step-by-step tutorial. I told you it was a small bench! 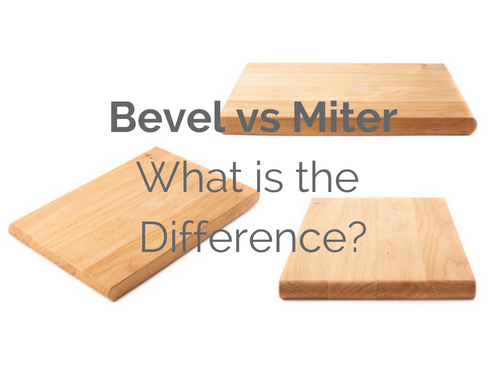 These measurements can be easily adjusted to fit your space. add some length to the seat and the shelf and you’re there! That is the beauty of DIY! 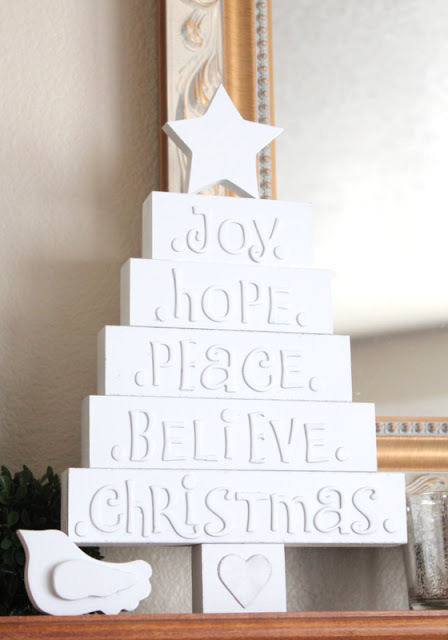 Take your 1×6″ pieces and glue them together to make the seat. 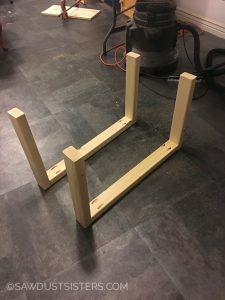 You could use the kreg Jig here, but I chose to glue them because I knew I would be screwing the frame to the seat later. 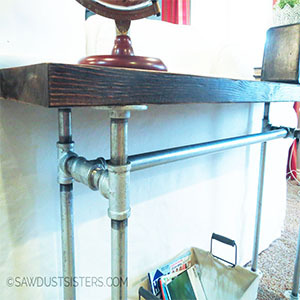 Use a bar clamp (the kind of clamp that goes really wide) to hold the pieces together for a strong hold. 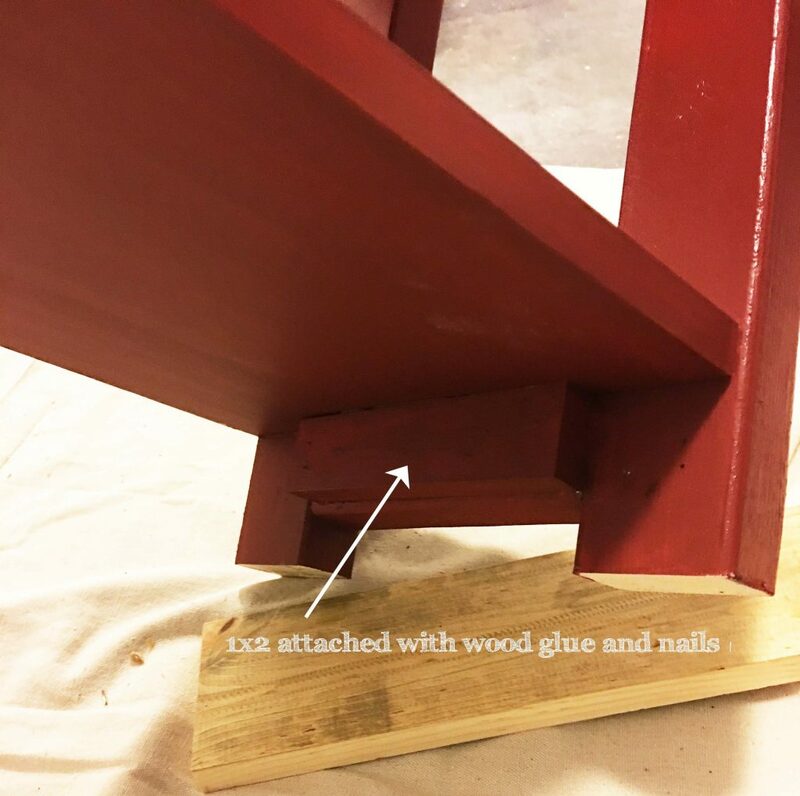 When using stain, it is easier to stain the pieces before the entire thing is assembled, especially if you will be painting the frame a different color. I learned this the hard way before! 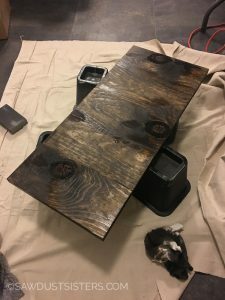 I waited a few hours to make sure the pieces were well glued, then I a applied a dark walnut stain with a rag and let it dry while I built the frame. 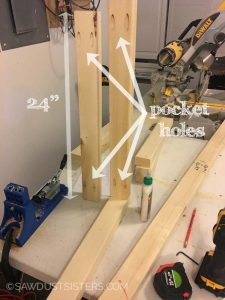 To build the frame, drill pocket holes on the 24″ 2×3 pieces. Then attach the 4 legs pieces to the ends using pocket screws . Use glue at every seam! You should end up with two “U” pieces like these. 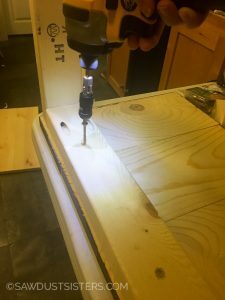 Next, attach the U pieces to the seat using 2″ wood Screws (these are my favorite screws because you don’t have to drill pilot holes. I got no time for pre-drilling!) The two U pieces are pretty close to the same width as the seat, so I pretty much eye-balled the placement and drilled the two pieces on either side on the seat with three screws on each side. 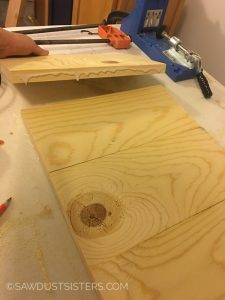 You should have some leftover 2×3″ pieces. Measure the distance between the legs underneath the seat, then cut the crossbar that goes between the legs at the bottom. 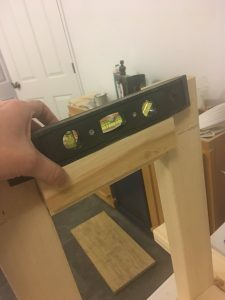 Measuring on top lets you end up with nice parallel legs after you attach the crossbar! 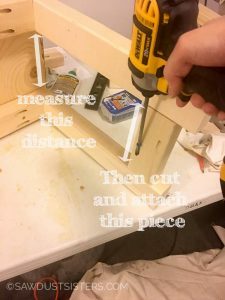 To attach the crossbar, drill a pocket hole on each end and attach them one inch from the bottom using pocket screws and glue. If you are a visual person like I am, just look at the pic below and it will make more sense!! Attach a piece of 1 x 2″against the crossbar using wood glue and nails. Make sure it’s level. This will support the shelf. 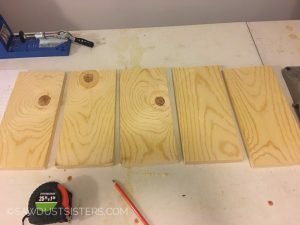 The 1 x 12″ shelf piece will be glued to the top of these, or it can simply rest on top if you want the shelf to be removable. 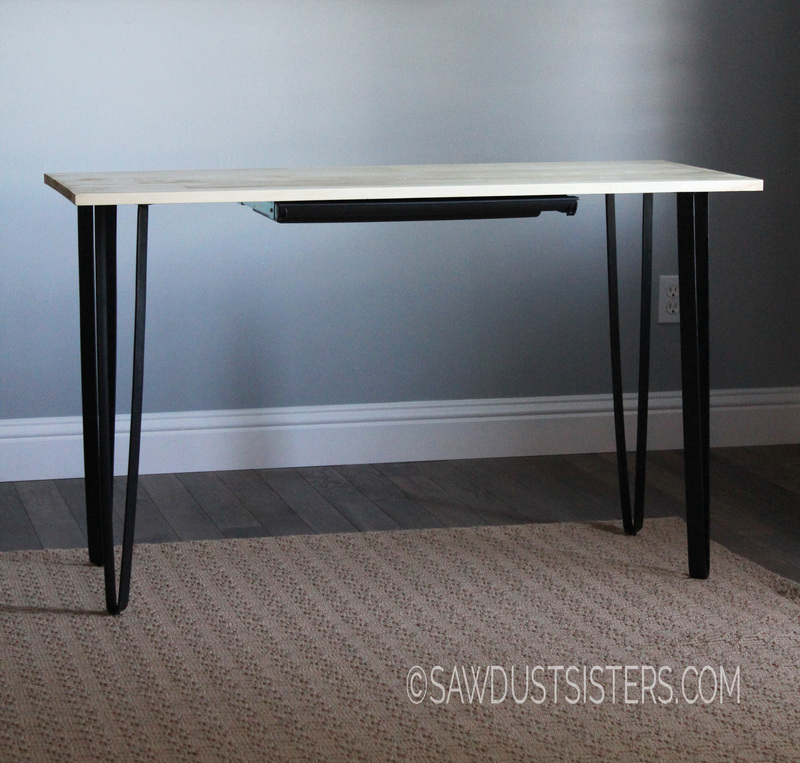 After it was all put together I gave the whole thing a little sanding using my handy dandy battery operated sander . 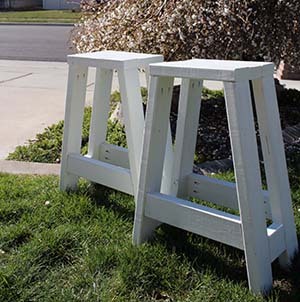 DIY Wood Bench-only $15 in lumber! Thanks for stopping by! 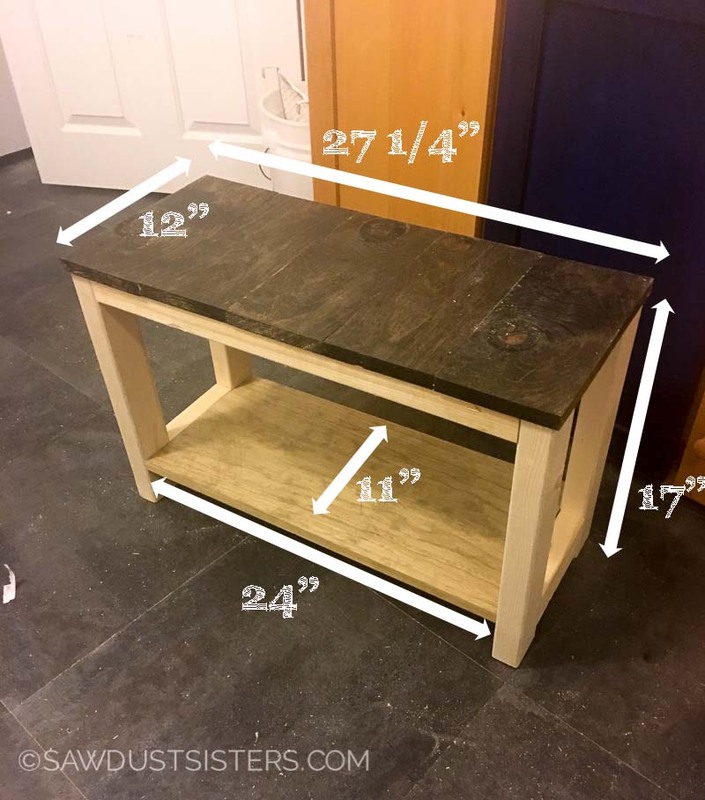 If you like what you see join the DIY sisterhood and be notified of new posts (about twice a month) and you will get a free set of plans to build these awesome 2×4 barstools! 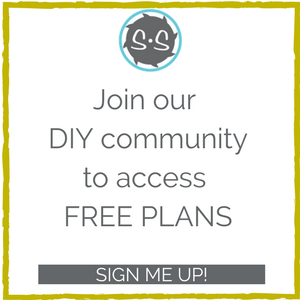 More plans are added regularly and they are all FREE to subscribers, so stay in the loop! So awesome, I love the color you chose and the wood top. 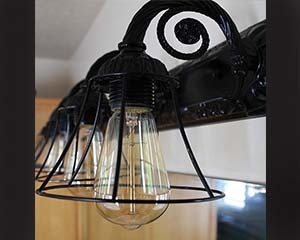 Perfect for any spot in your house! It turned out amazing! 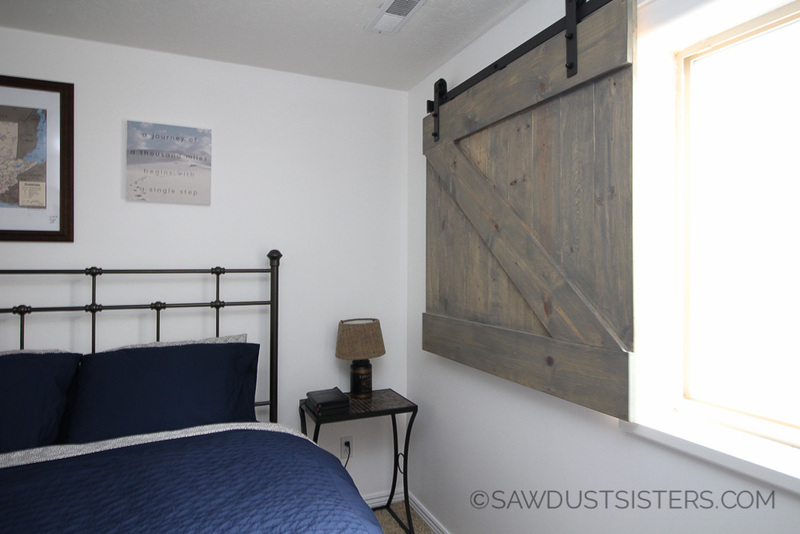 I love how you used scrap wood. I need to use up my pile of scraps! Oh my goodness Ivory! What a sweet thing to say!!! You just made my day. I’m so glad you liked it!